Because Srila Giri Goswami Maharaja spoke English very well, he could understand everything the Governor was saying. He was accustomed to lecturing in English as per the instructions of Śrīla Prabhupāda, and so he did not hesitate to speak to the governor in English. He said, “I request you not to become angry with these people. They only let me in because I showed them the letters from the Governor General.” Srila Giri Goswami Maharaja handed him the handwritten letters, which were personally addressed to Srila Maharaja. The governor was astonished. “Who are you?” he demanded. “From where have you come? And why did the Governor General write you these letters? I too receive letters from him, but to this day, I have never received a single letter with his signature on it. They are always marked with the words ‘from the Governor General.’ And you have not one, not two, but three letters, penned with his own hand, no less.” As he said this, he escorted Srila Maharaja into his chambers with the utmost regard. Srila Giri Goswami Maharaja explained, “I first met the Governor General when I submitted a proposal to him in Kolkata. I proposed that the government allocate land for my gurudeva’s mission and assist in our preaching. He asked me about the mission, and I explained that its goal is to benefit the whole world. “After conversing for a long while, we developed a mutual friendship. Srila Giri Maharaja replied, “There are three types of official telegraphs: standard, express and state. When a state telegraph arrives at any office, the staff regards the messages of any standard or express telegraphs that may have arrived as insignificant by comparison. The priority shifts in favor of the state telegraph, and the staff deploys its entire energy in fulfilling the instructions therein. If any brahmacari or sannyasi happened to be in need, Srila Giri Gosvama Maharaja would immediately send him money. For instance, when Guru Mahārāja was collecting money for the bail of Śrī Śrīmad Bhakti Prajñāna Keśava Gosvāmī Mahārāja, Śrī Śrīmad Kṛṣṇadāsa Bābājī Mahārāja, and a number of other devotees who had ended up in jail due to false allegations, Śrīla Giri Gosvāmī Mahārāja handed Guru Mahārāja forty-five of the fifty rupees he had to his name. Śrīla Keśava Gosvāmī Mahārāja (then Śrī Vinoda-bihārī Brahmacārī) was once visited by his godbrother Śrī Nārāyaṇa Mukhopādhyāya on the day of Ekādaśī in his maṭha, which was at the time a rented house at Bospada Lane in Kolkata. Śrī Vinoda-bihārī Brahmacārī was greatly distressed that day by the fact that he did not have a single paisa to serve his godbrother during his visit. Miraculously, a sparrow dropped a small packet containing six-and-a-half annas (about forty paisā) in the courtyard, and with that he was able to servehis godbrother. That same day, he also received a money order for one hundred rupees from Śrīla Giri Gosvāmī Mahārāja, who had tracked him down and sent it after hearing he had left Śrī Caitanya Maṭha without taking anything with him. When Śrī Śrīmad Bhakti Sāraṅga Gosvāmī Mahārāja went to preach in the West, he did not take any money with him, but rather resolved to depend entirely on whatever donations he would manage to solicit during his preaching there. When Śrīla Giri Gosvāmī Mahārāja found out about this, he sent a money order to him, as well. 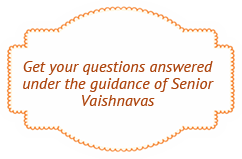 If you have great wealth, remain detached and use it to serve the Vaisnavas. Always be kind to everyone and engage yourself in the constant worship of Śrī Śrī Rādhā-Kṛṣṇa while maintaining saintly conduct. Śrīla Giri Gosvāmī Mahārāja then took Guru Mahārāja’s hands in his own and said, “It is only after you accept this maṭha that I will be able to leave my body peacefully.” Saying this, Śrīla Mahārāja wept. Being profoundly impacted by the intensity of his emotion, Guru Mahārāja agreed to accept Śrī Vinoda-vāṇī Gauḍīya Maṭha. When Śrīla Giri Gosvāmī Mahārāja later fell from a roof, Guru Mahārāja engaged Śrī Nitāī Prabhu, his own disciple, in Śrīla Mahārāja’s service. Guru Mahārāja was greatly pleased by the way Śrī Nitāī Prabhu served Śrīla Giri Gosvāmī Mahārāja. Once, when Śrīla Giri Gosvāmī Mahārāja arrived at our Śrī Caitanya Gauḍīya Maṭha branch in Kṛṣṇanagara, he realized he had not received the required letter of permission from Guru Mahārāja to stay there for a few days, and that he had altogether forgotten to inform him about his intention to do so. “What should I do now?” he asked me. Once, Guru Mahārāja invited many of his godbrothers to a grand festival at the Kolkata branch of Śrī Caitanya Gauḍīya Maṭha, which at the time was situated in a rented building on Rāsa-bihārī Avenue. There were three designated places where prasāda was served to the devotees attending the event, but Guru Mahārāja’s godbrothers were served prasāda in Guru Mahārāja’s quarters. Śrīla Giri Gosvāmī Mahārāja was the most senior godbrother there, and so we seated him at the head of the line and served him the various prasāda preparations first. Once Guru Mahārāja’s godbrothers had finished honoring prasāda, they called out “Nitāi-Gaura haribolo!” and got up. One by one, they trickled out the door, until finally, only Śrīla Giri Gosvāmī Mahārāja remained. Just as I was about to collect the discarded leaf plates and take them to the dust bin, I saw Śrīla Giri Gosvāmī Mahārāja begin to honor remnants from each and every one of his godbrothers’ plates. I immediately notified Guru Mahārāja, who was standing just outside the room. Guru Mahārāja then entered the room and, following Śrīla Giri Gosvāmī Mahārāja, also began honoring the remnants of his godbrothers. The foot dust of the devotees, the water that washes their feet, and their remnants are three greatly powerful items. Guru Mahārāja employed many techniques in his earnest attempts to comprehensively propagate the current of Śrīla Prabhupāda Bhaktisiddhānta Sarasvatī Ṭhākura’s precepts. He traveled to many places, established maṭha-mandiras, published magazines, bestoweddīkṣā to new initiates, awarded sannyāsa and saffron cloth to maṭha residents, and performed many otherfavorable activities. Uniquely, instead of signing the certificate himself, Guru Mahārāja would have his senior godbrother Śrī Śrī Bhakti Sāraṅga Gosvāmī Mahārāja sign it, and after Śrīla Gosvāmī Mahārāja’s disappearance, Śrīla Giri Gosvāmī Mahārāja was assigned that task. Guru Mahārāja would accord them great honor by appointing them chairman of Śrī Caitanya-vāṇī Pracāriṇī Sabhā, and he would ask them to personally present from their own lotus hands the certificates to their respective recipients. The Śrī Gaura Āśirvāda certificate awarded to me when I was a brahmacārī, for example, was presented by Śrīla Giri Gosvāmī Mahārāja and bore his signature. In this way, Śrīla Giri Gosvāmī Mahārāja inspired many gṛhastha devotees of Burma (now Myanmar) and India to yearly offer one month’s income for the service of Bhagavān and His bhaktas. Once, when Śrīla Giri Gosvāmī Mahārāja came to our maṭha in Kṛṣṇanagara, I requested him to speak hari-kathā one morning during his stay. He said, “In the realm of bhajana, there is no consideration of senior or junior. Śrīla Kavirāja Gosvāmī has written ‘ĵei bhaje sei baḓô—those who serve Śrī Kṛṣṇa are great.’ True seniority in the maṭha depends on the extent to which one respects and follows the teachings imparted here, and not on the number of days one has physically spent in the maṭha. “Save it for later. I will have it with noon prasāda,” he said, as he continued with other morning duties. I asked the clerk to please call for the registrar, to whom I then spoke about the glories of Śrīla Giri Gosvāmī Mahārāja. Somehow, I convinced him to accept our form. The childlike manner in which Śrīla Mahārāja confided his heart to me was profoundly unassuming and innocent. Śrīla Giri Gosvāmī Mahārāja once sat me down beside him and gave me the following instruction: “Unless honoring prasāda in a group, never eat anything in front of others lest you cause them to crave it. Do not wear clothes others would want to wear, and do not furnish your room in the way householders do; keep it simple and neat.” These were principles that he not only taught, but followed himself in the course of leading a very renounced life. I venerate Śrī Gaurāṅga Mahāprabhu and Śrī Nityānanda Prabhu, whose arms are long, reaching past Their knees; whose complexions are like that of pure gold; who are the inaugurators of sankīrtana; whose eyes are lotus-like; who maintain the universe; who are the best of the dvijas (twice born); who uphold the ultimate spiritual practice for the current age; who are the world’s benefactors; and who are incarnations of compassion. Once, Śrīla Giri Gosvāmī Mahārāja enacted such a grave illness pastime that he required both an eye operation and a blood transfusion. He was admitted to the Presidency Government Hospital in Kolkata, which during British rule treated only officers working in top positions. After India gained independence, however, it was made open to everyone, and Śrīla Giri Gosvāmī Mahārāja was checked in to the hospital’s finest division, the Woodburn Ward. practically vying for the chance to give blood. I was included among the few devotees who had their blood tested. My blood group turned out to be O. The doctor said, “This blood type can work, but it would be better to find someone with the same blood group as Mahārāja.” When he later discovered that my godbrothers Śrī Bhakti Vijaya Vāmana Mahārāja and Śrī Madana Prabhu shared the same blood group as Śrī Giri Gosvāmī Mahārāja, he gave Śrīla Mahārāja the blood of Śrī Vāmana Mahārāja. Śrīla Giri Gosvāmī Mahārāja and Śrī Śrīmad Bhakti Hṛdaya Vana Gosvāmī Mahārāja shared a special affection, partly because Śrīla Prabhupāda had awarded them sannyāsa on the same day. At the same time that Śrīla Giri Gosvāmī Mahārāja manifested his disappearance pastime, Śrīla Vana Gosvāmī Mahārāja was undergoing treatment at a nursing home in Āgrā and required the use of a catheter. As soon as Śrīla Vana Gosvāmī Mahārāja heard that his godbrother entered nitya-līlā, with catheter in hand and despite the doctor’s objections, he left the hospital and departed for Vṛndāvana. There, he personally supervised all aspects of Śrīla Giri Gosvāmī Mahārāja’s samādhi ceremony. I have personally witnessed renowned Vaiṣṇavas—such as Guru Mahārāja, Śrī Śrīmad Bhakti Prajñāna Keśava Gosvāmī Mahārāja, Śrī Śrīmad Bhakti Saurabha Bhakti-sāra Gosvami Mahārāja, Śrī Śrīmad Bhaktyāloka Paramahaṁsa Mahārāja and others—express their immense affection for Śrīla Giri Gosvāmī Mahārāja. That such exalted devotees possessed faith in him is a testament to his illustrious Vaiṣṇava qualities. Pūjyapāda Giri Mahārāja appeared in a distinguished, aristocratic family inthe city of Ḍhākā, East Bengal (now Bangladesh), in 1899. From childhood, he displayed a rather detached disposition. He was indifferent to what he ate or wore and had no taste for playing. He was of a sober nature. He spent a great portion of his time associating with sādhus and pious persons. Observing his attachment to religious activities, his father and mother thought that perhaps either a demigod was controlling him or that he was under the influence of some astrological event. Being worried for the trajectory of his life, they anxiously prayed at Śrī Bhagavān’s lotus feet for their son’s welfare. In November, 1921, during the month of Kārtika niyama-sevā, our most worshipful Śrīla Prabhupāda was lecturing on Śrīmad-Bhāgavatam in Ḍhākā at the house of Śrī Sanātana dāsa Mahāśaya, a renowned and wealthy landowner who has since passed. During that time, many educated, high-class individuals became attracted to Śrīla Prabhupāda, for they had never before heard anything quite like his discourses. Śrīla Prabhupāda’s disciple parivrājakācāryatridaṇḍi-svāmī Śrīmad Bhakti Pradīpa Tīrtha Mahārāja, who has since left thisworld, also lectured on Śrīmad-Bhāgavatam for some days there. Śrīmad Giri Mahārāja, then known as Indu Bābū, would visit Śrī Sanātana dāsa Mahāśaya’s home to hear Śrīla Prabhupāda’s hari-kathā. Later, when he took shelter of paramārādhyatama Śrīla Prabhupāda, he became Śrī Gaurendu Brahmacārī,and once he received sannyāsa, Śrīla Prabhupāda gave him the name tridaṇḍī-svāmī Śrīmad Bhakti Sarvasva Giri Mahārāja. From that time onward, as per Śrīla Prabhupāda’s order, Śrīpāda Giri Mahārāja vigorously preached in various places in India, thereby fulfilling his gurudeva’s innermost desires. Pūjyapāda Giri Mahārāja was a fearless speaker who captivated audienceswith his thunderous voice and the spirited, compelling language he utilized in his lectures. In fact, his voice was so powerful that he never required the assistance of a microphone. I was delighted to review the certificate Bhakti Sarvasva Giri obtained from the English. I experience boundless joy to see our sannyāsīs and brahmacārīs going from place to place acquainting people with their competence. We saw that various other governors, viceroys and distinguished royal personages had sent Śrī Giri Mahārāja many other letters in which they profusely praised his preaching efforts and displayed plentiful enthusiasm regarding the widespread propagation of Śrīman Mahāprabhu’s religion of divine love. Although Śrīla Prabhupāda had many highly educated and English-speaking disciples in his Śrī Caitanya Maṭha—his principal maṭha in Śrīdhāma Māyāpura—and its various Gauḍīya Maṭha branches, Giri Mahārāja’s style of both spoken and written English was profusely praised by especially qualified individuals, like Śrī Niśikānta Sannyāl (Śrīman Nārāyaṇa dāsa Bhakti Sudhākara Prabhu), a professor of history at the Ravenshaw College in Cuttack. Pūjyapāda Mahārāja possessed an amazing ability to captivate his listeners.As paramārādhyatama Śrīla Prabhupāda and the Vaiṣṇavas under his guidance accept a person’s natural qualities above all else, they all loved his speeches. conviction in the service of śrī guru, his indomitable enthusiasm in and attachment to performing bhāgavat-kathā and kīrtana everywhere, and his ability to subdue dissenters—were truly exemplary. Through his body, mind and words, Śrī Giri Mahārāja made sincere, wholehearted efforts to fulfill the innermost desire (mano’bhiṣṭa) of paramārādhyatama Śrīla Prabhupāda, and he preached that mano’bhiṣṭa in thetemples and maṭhas Śrīla Prabhupāda established, as well as in various places all over India. He spread the sacred teachings practiced and preached by Śrīman Mahāprabhu by unveiling Sat-śikṣā Pradarśinī exhibitions in Śrīdhāma Māyāpura, Kolkata, Ḍhākā, Paṭnā, Allahabad, Kurukṣetra and other places. He also distributed devotional literatures and magazines and rendered comprehensive services in Śrī Gauḍa-maṇḍala, Śrī Kṣetra-maṇḍala and Śrī Vraja-maṇḍala. All of Śrīpāda Giri Mahārāja’s service efforts are, in all respects, noteworthy. During the manifest presence of Śrīla Prabhupāda, Śrīmad Giri Mahārāja was the driving force behind establishing a Gauḍīya Maṭha in Rangoon, Brahmadeśa (Burma), where deities were later established due to his tireless efforts. In order to transform the Śrī Gauḍīya Maṭha center Śrīla Prabhupāda established in Lucknow into a permanent maṭha, he occupied a huge two-story house in 1938 and acquired deities. Pūjyapāda Giri Mahārāja was principally responsible for procuring theland for Śrī Sārasvata Gauḍīya Maṭha in Haridvāra, and he also oversaw the construction of its residential quarters. Additionally, he gave much of his life’s energy to the service of Śrī Paramahaṁsa Maṭha in Naimṣāraṇya. It was after listening to the hari-kathā issuing from the worshipful lotus mouth of Śrīla Giri Mahārāj that Rāya-Bāhādura Śrī Madana-gopāla Sardānā Mahodaya, the then Superintendent Engineer of Irrigation for Uttar Pradesh, obtained the fortune of accepting the shelter of Śrīla Prabhupāda’s lotus feet.Pūjyapāda Mahārāja even imparted the message of Śrī Śrī Guru-Gaurāṅga toRāya-Bāhādura J.N. Rāya, the resident District and Session Judge of Lucknow who is now deceased, as well as other distinguished figures in Uttar Pradesh. Through these personalities, Śrī Giri Mahārāja accomplished tremendous service to śrī maṭha. After paramārādhyatama Śrīla Prabhupāda’s disappearance pastime on 1 January, 1937, his distinguished disciples gathered in Śrī Bāgbāzār Gauḍīya Maṭha to form a governing body that would oversee the maintenance of the maṭhas and temples he established. For a period of time thereafter, ŚrīpādaGiri Mahārāja served as a member of this governing body and rendered much service to śrī maṭha with noble enthusiasm and a strict dedication to the truth. Pūjyapāda Mādhava Mahārāja, the overseer of Śrī Caitanya GauḍīyaMaṭha, shared a genuine bond of friendship with Śrīla Mahārāja. Śrīmad Giri Mahārāja was a prominent member of the managerial committee for the Sanskrit school Śrīpāda Mādhava Mahārāja established at Īśodhyāna, Śrīdhāma Māyāpura. Also, on the annual occasion of Śrī Gaura Janmotsava, Śrī Mādhava Mahārāha would appoint him as chairman of the Śrī Caitanya-vāṇī Pracāriṇī Sabhā hosted by Śrī Caitanya Gauḍīya Maṭha in Śrīdhāma Māyāpura. When Śrīla Bhakti Dayita Mādhava Gosvāmī Mahārāja first received word of Śrīla Mahārāja’s illness, he issued specific directives by both wire and letter to the sevakas of Śrī Caitanya Gauḍīya Maṭha in Śrīdhāma Vṛndāvana to serve him by all means and to arrange for his treatment. Bhakta Śrī Nitai dāsa remained with Śrī Giri Mahārāja day and night, and he tirelessly and smilingly engaged in serving him in every way. Being satisfied by Śrī Nitai dāsa’s sincere service, Śrīla Giri Mahārāja blessed him profusely. The absence of a pure Vaiṣṇava such as Mahārāja overwhelms everyone’s heart with pain. Perhaps it was because he knew, by divine ability, that he would not remain in this world for long that he was inspired to offer the responsibility of Śrī Vinoda-vāṇī Gauḍīya Maṭha to Śrīpāda Mādhava Mahārāja, even though he had sannyāsī disciples to whom he could have bestowed this service. Among the 8,400,000 species of life, attaining that of a human is indeed rare, for although it can end in a moment, it is especially favorable for bhagavad-bhajana. Even the demigods of heaven sing profuse praise of theattainment of this spiritually advantageous human birth within the land of India, which is considered the courtyard of Vaikuṇṭha, the spiritual realm. However, it is stated, “tatrāpi durlabham manye vaikuṇṭha-priya-darśanam—among the embodied forms of life, the fickle human form is rare, but even more rare is to catch a glimpse of a devotee who is dear to the Supreme Lord.” What greater sorrow can there be than being deprived of the company of a pure devotee who has surrendered to a bona fide guru and is dedicated to the service of Śrī Hari, guru, and Vaiṣṇavas? his sweet, radiant, moonlike form, hearing his hari-kathā and remembering him would sanctify one’s heart and arouse within it a longing to perform bhagavad-bhajana with one’s body, mind and words. His śrī gurupāda-padma displayed great compassion toward him and granted him the name ‘Bhakti Sarvasva,’ which means ‘he whose all in all is bhakti.’ Until the very last moment of his manifest presence, he lived up to that name by leading a spotless, exemplary life of supreme sanctity with krsna-bhajana as his only aim. —the presiding deity of sambandha-tattva (the principle of divine relationship) and the very life of Śrī Sanātana Gosvāmī—but also his śrīgurupāda-padma, whose eternal identity is conveyed by the name ŚrīVārṣabhānavī Dayita dāsa—the servant of the beloved of Śrī Rādhā, the daughter of Śrī Vṛṣabhānu Mahārāja—and who is Śrī Rādhā’s nayana-maṇi, the jewel of Her eyes. Such great fortune is never indicative of ordinary spiritual merit. Know for certain that whatever behavioral sorrows one observes in a Vaiṣṇava are actually the utmost ecstatic joy. Śrīla Mahārāja’s enactment of illness was a grand example of these words, which have been proclaimed by our exalted predecessors. the title ‘Bhakti Sarvasva.’ What stone-like heart would not melt upon losing such a soul mate, a parama-bhāgavata devotee whose life and soul was the service of Kṛṣṇa and kaṛṣṇā, those who belong to Kṛṣṇa. Serving the innermost desires of Śrīla Prabhupāda was his very life. Prabhupāda, who is supremely compassionate, therefore granted him, his dear associate, the eternal qualification to serve as the servant of the servant of the beautiful lotus feet of Śrī Vārṣabhānavī-dayita Śrī Madana-mohana. Śrī Śrī Madana-mohana-jī inspired the hearts of His Gosvāmī servants and the honorable mayor of Śrī Vṛndāvana to be favorably inclined toward him. In this way, He gave His dear associate a place close to His lotus feet, thereby granting him the eternal qualification to serve Him. Blessed is bhakta-vatsala Bhagavān’s affection for His devotees. Just as it is unlikely that the wooden sticks flowing in a stream will meet or stay together, it is rarely possible for friends whose fates are divergent to remain together. This truth certainly applies to all of us, as well. Mercifully, Kṛṣṇa gave me his association. By Kṛṣṇa’s independent will, our exchange has ended. end, first melt me with joy, and then throw me into an ocean of sorrow. Just a few days before he left this world, he appeared to me in a dream looking recovered and healthy. This infused my heart with great hope. But alas! All my hopes have been dashed. It is heartbreaking to realize I will never again have his darśana in this life. Śrī gurupāda-padma is our eternal master, birth after birth, and similarly,his intimate companions who have offered their lives to him will forever remain our closest friends. We remain eternally rooted in an inseparable relationship with them life after life. It is only as a result of gurur-avajña, the grave offense of disobeying the spiritual master, that a person’s heart becomes hard-hearted, deviates from this knowledge of our eternal relationships, becomes the servant of Māyā and thereby becomes bound by the chains of worldly desires. Pūjyapāda Giri Mahārāja has attained the eternal shelter and guidance ofhis śrī gurupāda-padma, the crown jewel of the āśraya-vigrahas (the repositories of devotion) who rests now at the feet of Śrī Govardhana-Girirāja, the principal viṣaya-vigraha (object of devotion) in Śrī Vraja-dhāma. It is said, “vaiṣṇavera kṛpā ĵāhe sarva-siddhi—all perfections are attained by the mercy of the Vaiṣṇavas.” I therefore submit this pitiful prayer at his lotus feet: May he grant us the qualification to tread the same path to Vraja. 1 Lit. ‘the Assembly for Preaching the Message of Śrī Caitanya;’ an annualconference established by Śrī Śrīmad Bhakti Dayita Mādhava Gosvāmī Mahārāja. 2 Śrī Vinoda-vāṇī Gauḍīya Maṭha is situated on the same lane andapproximately two hundred meters south of Śrī Śrī Rādhā-Madana-mohana’s temple in Vṛndāvana.